One of our favorite things is to customize any space with either a built-in or free-standing elegant solution, perfectly styled to meet the needs of the people living there. Let us put our design skills to work for you! We created a raised feeding station with dog food storage. The kibble drawer is removable for cleaning and the exterior is finished it to match our interior decor for a solution that meets the needs of everyone in our family, pup included! This little nook at the end of our refrigerator was begging to be put to use so we created a combination 2-sided garbage/recycling center below with cookbook storage and display above. 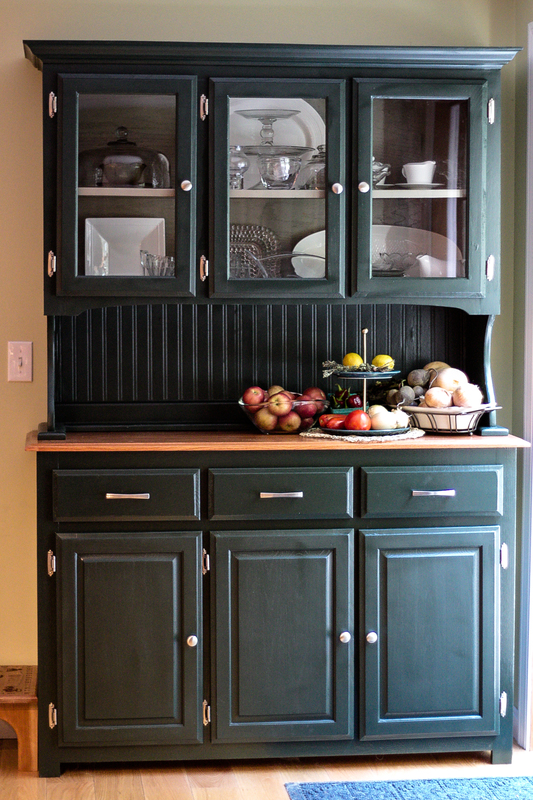 The beautiful grain on this cherry piece blends seamlessly into our kitchen. A bedroom renovation required a stylish narrow table to hold a television and some framed artwork. Nothing off-the-shelf would do. We designed and built this beauty and would love to customize something like this for your home! Its finished with a satin touch clear coat on a high quality cherry, and has a grey-blue furniture-grade semi-gloss painted base to highlight the curves on the turned legs. Our outdated pantry sorely needed a better solution than the dated wire rack shelving rendering more than half the storage space useless. We came up with a plan and built sturdy attractive system for storing a much larger capacity in a grocery-style display to make finding everything simple.